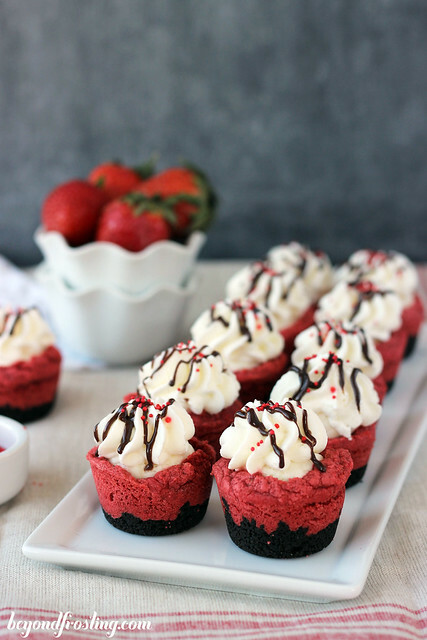 These Red Velvet Cream Pie Cookie Cups are filled with love and lots of flavors. 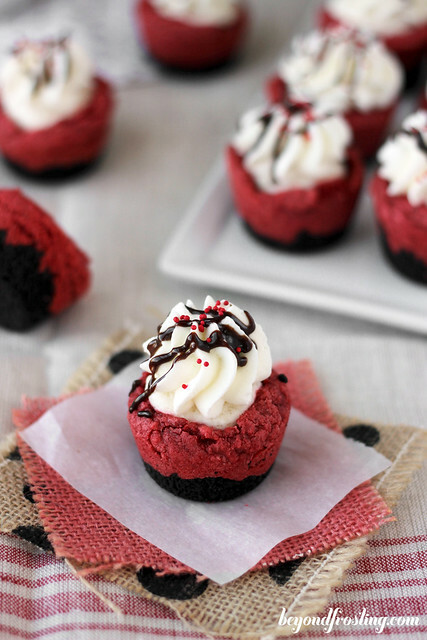 A red velvet cake mix cookie sits on top of an Oreo cookie crust. 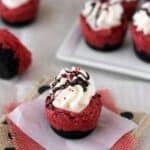 The luscious white chocolate mousse filling is then topped with homemade whipped cream and drizzled with fudge sauce. You know what is better than pies? 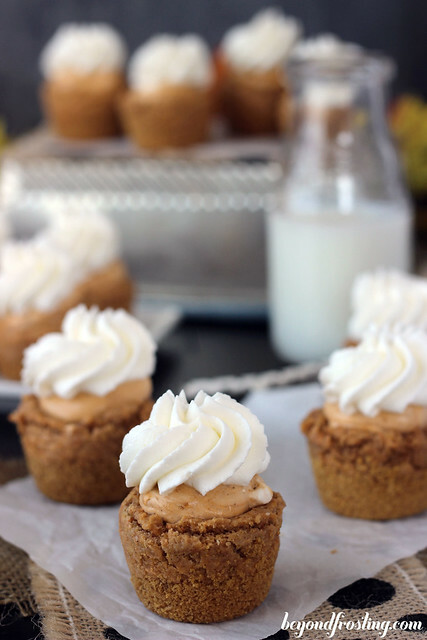 Mini pies. I think that is why I have become so obsessed with cream pie cookies. It all started with my Coconut Cream Pie Cookies and since then I have done a peppermint and a pumpkin version. I’ve got some more in my back pocket too. 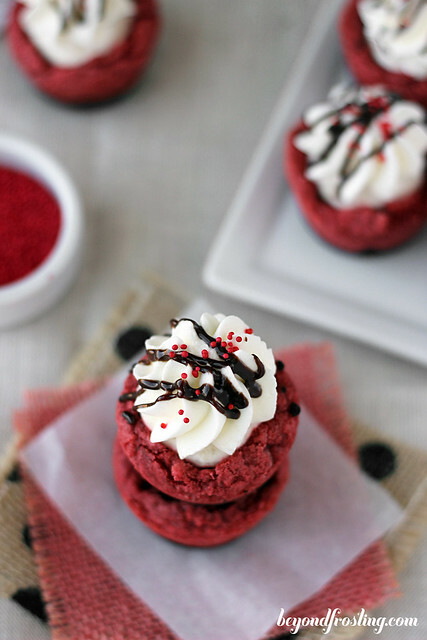 I thought it was fitting that I make a Red Velvet Cream Pie Cookie for Valentine’s day. 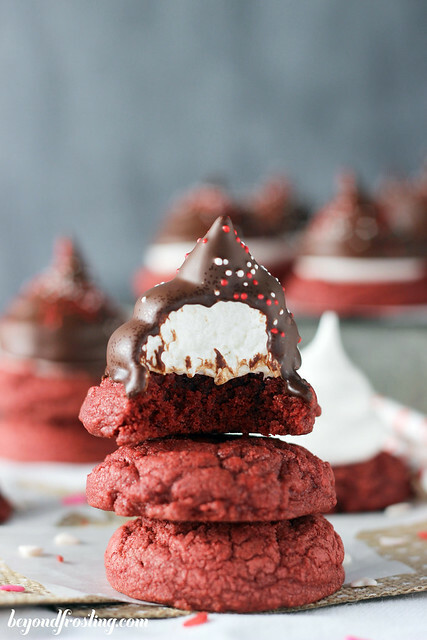 The red velvet cake mix cookie returns. The cookie is just so incredibly soft that it makes for a perfect cookie cup. All cream pie cookies must start with a crust. For the red velvet cream pie, I chose to do an Oreo crust. 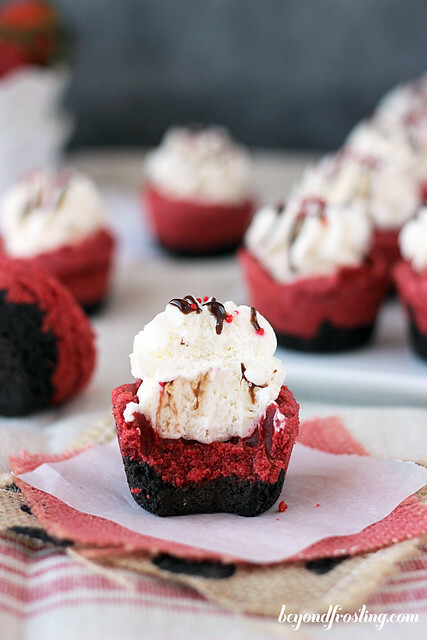 I really love how the chocolate cookie contrasts the color of the cookie cup. 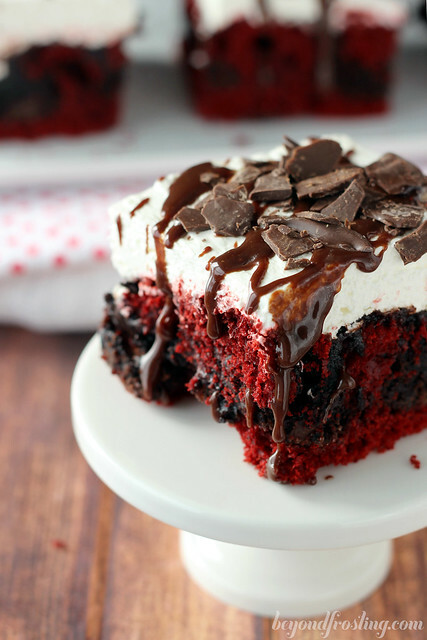 Plus, I kinda have a thing for red velvet and chocolate. 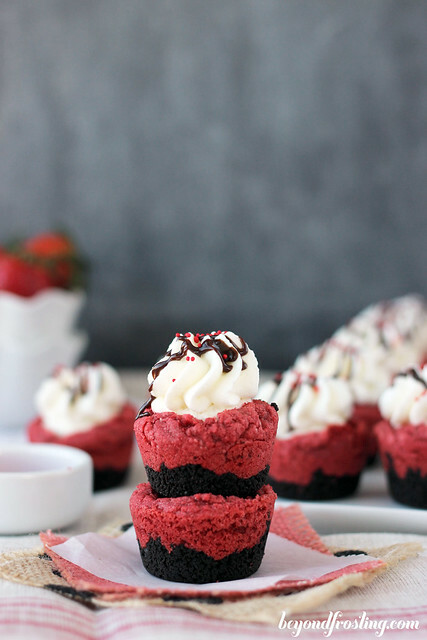 Although I have admitted before that red velvet cupcakes are far from a favorite of mine, I do really enjoy the flavor when it comes to other types of desserts! 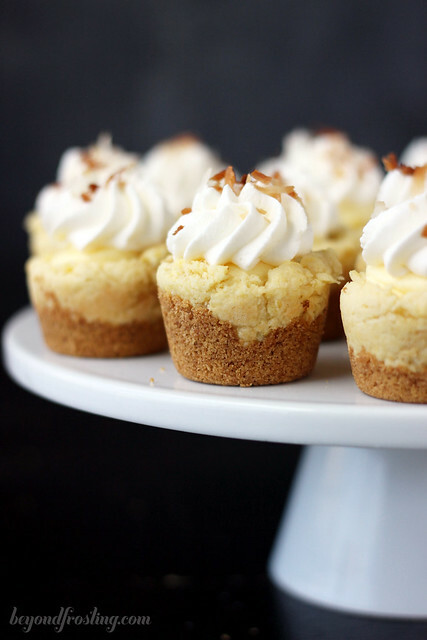 The pie filling, perhaps my favorite part of this dessert, is a white chocolate mousse. I used Hershey’s instant white chocolate pudding mixed with homemade whipped cream. Sometimes the white chocolate pudding can be difficult to find, so I might also suggest substituting vanilla pudding. For the filling, I use about half of what the normal amount of milk would be for a pudding. This helps make the mousse a lot thicker. It is just enough milk to mix into the pudding and have it dissolve. Then you fold in the whipped cream and allow the mixture to set for a little while. To top off these cookies, you use the remaining whipped cream. Every pie needs a dollop of whipped cream to finish it off. I drizzled my cookie cups with some chocolate sauce; I prefer to use hot fudge. It just gives these cookies that added ‘wow’ factor. Let me talk about the tools I use for a minute. I really like my Calphalon Nonstick 24-Cup Mini Muffin Pan . 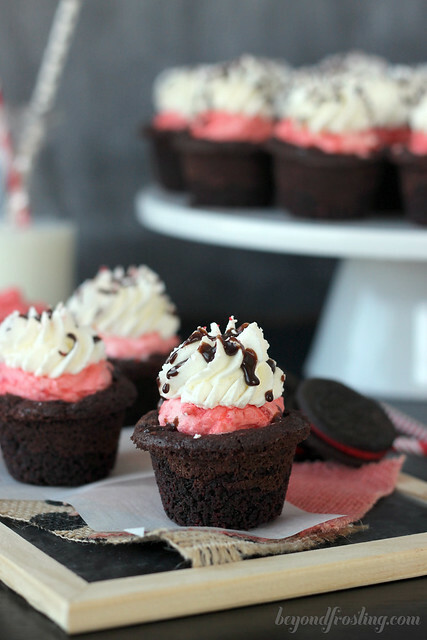 It is deeper than your average mini muffin pan, which is perfect for cookie cups. I also use a tart shaper, which is from Pampered Chef to make the cookie cups. If you don’t have a tart shaper, you can use another type of round object or a spoon of some sort. 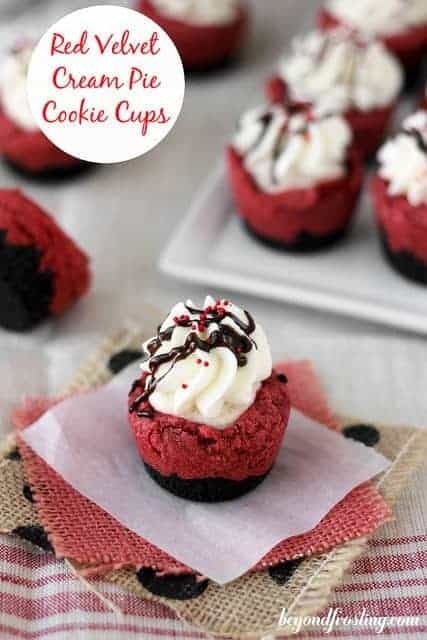 Once you add the filling to the cookie cups, you will need to keep them refrigerated. It is best if you can refrigerate for a little while before serving allowing the mousse to thicken. 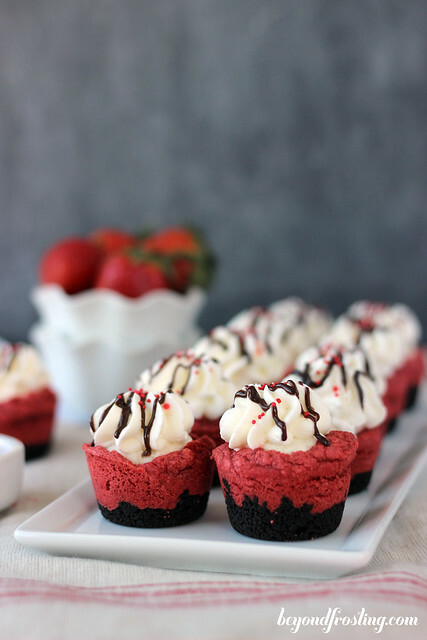 There is plenty to go around here, so share with your sweetie and maybe a friend too! Pre-heat oven to 350° F. Grease a mini muffin pan with cooking spray or Crisco. Soften butter in the microwave for 15 seconds. Combine softened butter and sugar in a mixing bowl. Beat on medium speed until light and fluffy; 2-3 minutes. Reduce mixer to low speed and slowly add dry ingredients. Once combined, increase speed to medium high and beat for 1-2 minutes until soft dough forms. 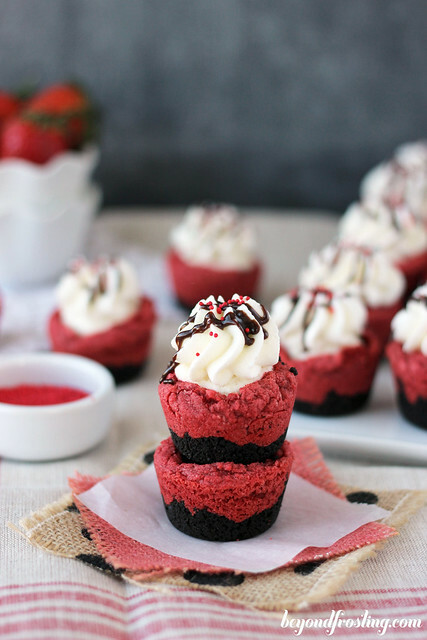 Add red food coloring for a deeper red color if desired. Drop 1-1.5 tablespoons of dough into the greased mini muffin pan on top of the Oreo crumbs. Bake at 350°F for 12-15 minutes. Combine instant white chocolate pudding mix with milk. Whisk until powder dissolves. Refrigerate until pudding is firm. Top mousse with a dollop of the leftover whipped cream and drizzle hot fudge on top. 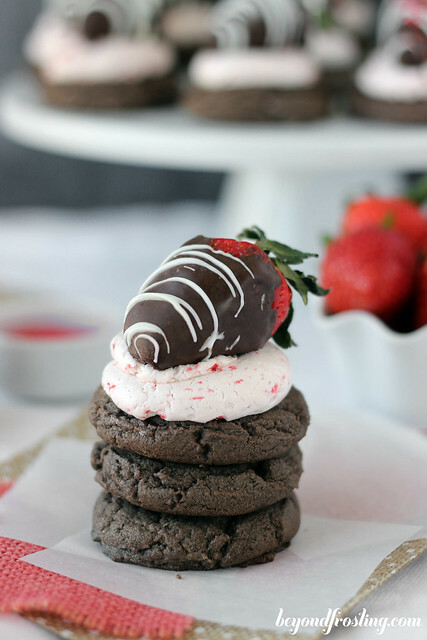 I have a deep dish mini muffin pan, which is great for these cookies. If you are using a standard size muffin pan, this will yield more cookies. Reduce the amount of crust and cookie dough for a standard size min muffin pan.